One device at home, all the world you have. 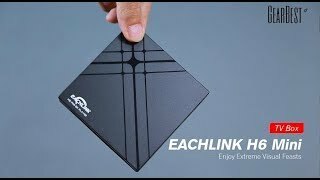 The EACHLINK H6 Mini TV Android box makes your world more wonderful You’re worth it. EACHLINK H6 Mini is equipped with 3GB DDR3 memory and 32GB EMMC50 Large memory makes H6 Mini have excellent multi tasking performance. 32GB storage space can meet your needs to install a variety of third-party applications. When presenting high-definition content, performance is more outstanding. Whether it’s high speed video or static pictures, can be clear to show. For the traditional TV box supports 8 Bit color depth, but The EACHLINK H6 Mini supports 10 Bit color depth can display. More color comparing the traditional 8 Bit color depth only supports 16 million colors and the real world far more than these colors 10 Bit provides 1.06 billion colors and restores a more realistic world colors, and greatly improves the viewing experience. Due to the excellent picture optimization engine, EACHLINK H6 mini’s image quality has been significantly improved integrated intelligent noise reduction super-resolution display, Refined deinterlace, color enhancement, color protection and other ten video displays / process technologies,and optimized and filtered every single frame.